On Media Piracy and "FairPlay Canada"
This is a new development to me, but then I haven't been following the issue of piracy all that closely for some time. The upshot is that a group of commercial interests are lobbying the CRTC to set up an anti-piracy panel. The submissions started flowing in after the coalition of more than 30 members — including media companies, unions and creative industry associations — submitted their request to the CRTC on Jan. 28. They propose that the CRTC create an independent agency to identify blatant piracy websites that internet providers would then be required to block their customers from accessing. The coalition, which calls itself FairPlay, says Canada needs to take action to stop the scourge of piracy sites that are threatening the country's cultural industries. It took a bit of digging (FairPlay Canada's website doesn't even register in Google's search results - in part because of the commercial brand FairPlay. I did, however, find quite a number of articles which give some clues as to who and what is behind FairPlay Canada. At a glance, this is not a surprising lineup of participants. Basically you have the major media corporations and the organized guilds of performers lining up to protect their commercial interests. When you go through the "harms caused by piracy" section of the FairPlay submission to the CRTC, as posted on the ACTRA website, we find a few things of interest. A lot of it comes down to the usual assortment of complaints about copyright violation, control over the work and so on (I'll come back to this later). The real crux of the argument boils down to complaints about the amount of "money lost to piracy". Inevitably, these arguments come back around to how those monies could be used to augment cultural efforts in Canada and so on. Digital piracy has been a fact of life ever since the personal computer emerged in the 1970s and companies have been trying to overcome piracy in one form or another for just as long. At first, it was so-called "copy protection" schemes which tried to make it harder to copy raw media (inevitably, every one of these schemes fell to some clever person's tinkering). By the late 1980s, it was trivial to copy pretty much anything from floppy disks to ROM cartridges, and more sophisticated attempts to curtail theft such as hardware dongles were routinely overcome with relatively trivial bits of software modification. In the 1990s, with the advent of the Internet, we saw the rise of modern digital piracy, where entire websites were dedicated to carrying bootleg media ranging from music to movies and software. (anybody else remember Napster?). In the late 1990s, the United States attempted to address these issues with the Digital Millennium Copyright Act (DMCA). Whether or not they succeeded in this endeavour is open to debate. I personally have never been impressed by the DMCA because it was so clearly written as a give-away to huge corporate interests (e.g. the ability to transfer copyright ownership from a person who created a work to an arbitrary corporation, which can then extend copyright indefinitely.) However, the DMCA only created a legal environment within which so-called "copyright theft" (piracy) could be prosecuted. It did not create a mechanism for addressing piracy itself. On the surface, if the FairPlay Canada proposal were to be enacted, it doesn't sound entirely unreasonable. Monitor and block piracy websites. Okay ... not entirely an unreasonable demand from a certain perspective. I can even agree that within certain parameters there is a validity to it. However, one can also imagine that it would rapidly become very difficult to identify a given site as specifically being a piracy driven site. For example, the website Mega is touted as a file storage archive / sharing site, but has been accused by various sources of being primarily a piracy site. Yet, in function it is similar to facilities like DropBox, Google Drive or Microsoft's OneDrive which are understood to be cloud storage services. So, one has to imagine that establishing criteria upon which such a determination could be made is going to be very difficult indeed. As the persistence of websites like The Pirate Bay has shown, tracking down and limiting the activities of piracy is pretty much the equivalent of a giant game of whack-a-mole. Shut down a piracy source in one place, and it will inevitably spring up somewhere else. We should not ignore the existence of alternate traffic routing services as a way to hide piracy sites as well. Tools like TOR, i2P and others essentially create a second web that is very difficult to trace. Telling ISPs to block specific sites is fairly easily undermined using tools like these. Talk to anyone who lives in a country like Egypt where the government routinely blocks access to various services on the Internet - there's always a workaround - don't imagine many countries are willing to invest the kind of resources that China has in their "Golden Shield Project", which is what would ultimately be necessary to rigorously enforce this proposal. At this point, I want to circle back to the claim of financial harms done by piracy. Often we see claims of millions of dollars in "lost revenue" from the anti-piracy lobby. Usually, this is computed by estimating the number of bootleg copies of a given item or service and then multiplying it by their standard rate for that product. If you take the view that piracy is the same as shoplifting, this almost seems like a reasonable approach. But, is piracy the same as shoplifting? I would argue that it is a quite different phenomenon, and one that needs to be explored more thoroughly. Where shoplifting may have a variety of causes, ranging from poverty to mental health issues, piracy does not have the same motivations associated with it. In my personal experience, piracy tends to be driven by a few different motivations: the "because I can" mentality; curiosity or test-driving a product; simple economics - it's cheaper. The "because I can" crowd you can pretty much write off as sales you will never make. These are the people who pirate stuff because it's possible for them to do so, and possibly because they get a thrill out of doing something borderline illegal. Fundamentally, it doesn't matter how hard you try to lock things down, these people will never pay for your product. If you will, It's quite relevant to understand that these people are doing it for "the thrill". You might be able to threaten them with various legal consequences, but that's about as far you will ever get. The last two groups are part of the market that is available to you as a vendor. They aren't your problem customer though. As a business, you haven't made them a customer yet. You need to figure out how to do that. Does that mean getting into bed with the pirate sites? Possibly. It might also mean coming up with a new way to market your product. Microsoft figured this out with their Office product, and switched to their "Office 365" subscription service. Suddenly, where a full featured copy of office used to be close to $700 CAD, it became ~$100 / year, and you get the updates as part of the bargain. I can't prove that this has reduced the number of bootleg installations of Office out there, but I do know quite a few people who switched to it when they realized that they could justify the annual subscription fee in their minds. What does this mean for streaming services, and their bootleg counterparts? Many of the bootleg streams charge a subscription fee too. It's pretty easy to extrapolate from there that these people are willing to pay something for the service, but perhaps find the current fees to be too expensive. Business is all about finding their market and engaging it. As much as you might want "all of the pie" in a particular domain, it's not going to happen. In digital media, it's the world of the bootlegger, in fashion, it's the knockoff maker, and on it goes. Recognizing that the industry in question is asking for some kind of remedy for their perceived woes, I will argue that the proposed remedy is both impractical, and intractable. It cannot work in any meaningful way, and will not work in the short term or long term. The commercial interests need to find a way to engage with the "commercial pirate" and come to a solution that works. There is no chance that a non-commercial pirate can be brought to heel - forget them - it's not worth the constant game of escalation. Lately, when debating matters of economics, people that I will broadly call "small government advocates" (usually hardline fiscal hawk conservatives and libertarians) will inevitably start throwing about the argument that "communism is a failed ideology" when they are challenged directly about the specifics of what they would cut from government, or on the flaws in their understandings. In the last week, I ran into one of these arguments when discussing (or trying to) several implicit assumptions in a libertarian's argument that governments have no right to levy taxes. The first form that these arguments often take is a consumer argument. 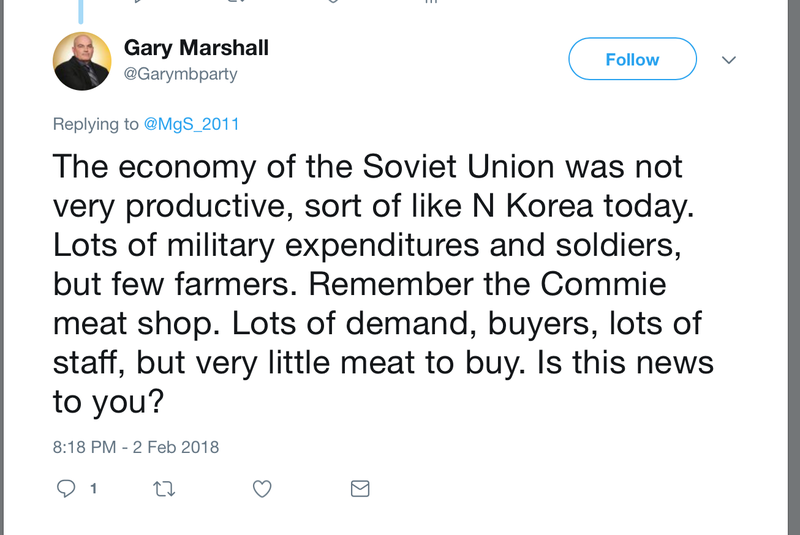 More or less, it boils down to "if you looked in a Soviet era grocery store, there was very little product available. Therefore, the system was a failure. ... and yes, by the late 1970s, the consumer side of the Soviet economy was clearly in deep trouble. The second argument basically involves pointing to Venezuela, a country which is currently in the midst of economic collapse. Of course, as the linked article points out, Venezuela's economic collapse is much more than a simple matter of having a "socialist" government (I'll come back to this in a little while). Not unlike Alberta, Venezuela has relied for far too long almost exclusively on resource revenues. When that sector tanks, so does their economy. The third argument is basically "communists have killed way more people than capitalists". Yes, it's certainly true that Stalin in the USSR murdered millions, Pol Pot in Cambodia oversaw the so-called killing fields, and so on. I don't think anyone can defend the actions of these dictators in any reasonable way, nor do I intend to. However, the argument that this shows that communism is fundamentally a bad way to run a country's finances is also problematic. In Canada, we have seen the federal conservatives use this as a propaganda tool, often to rail against any kind of social policy. (Government anything = socialism = communism, more or less). This argument is particularly annoying because it is fundamentally an emotional argument to start with, and one which is based on a resurrection of McCarthy era "red scare" propaganda. What's Wrong With These Arguments? I'm going to go through these in almost reverse order. First, let's start off with the basic assumption that "communism is bad". The examples cited for why communism is bad are almost all better understood as totalitarian dictatorships. Whether we talk about Stalin, Pol Pot or even Cuba's Fidel Castro, is that they were all fundamentally totalitarian dictators. Dictators, regardless of their political stripe are prone to being deeply destructive as they struggle to hold on to personal power. Whether we are talking about dictators the US supported for years like Panama's Manuel Noriega, or the monarchy in Iran, there were many abuses of power, both human rights, and greed focused. One only has to look at the history of American political interventions in Central and South America throughout the Cold War era, or in the Middle East since WWII to recognize that political expediency has ruled the day, with the government supporting governments that are ideologically aligned with them, even when that government is engaged in horrendous actions against its own people. The history of "capitalism" when it comes to human rights is just as dark as the communist dictators, the only significant difference is that it was largely done through proxy states. This is a perplexing equivalence. 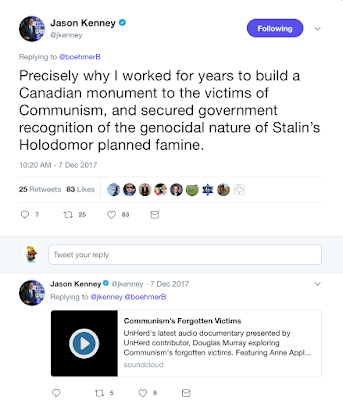 Anybody who has been through Canada's grade school system in the last fifty years would have gotten a pretty good dose of the different political "isms" that have been predominant since WWII. As economic theories, Capitalism and Communism are often held up as being diametrically opposed to each other, and Socialism is often portrayed as many variations in between. In Western countries, Capitalism is broadly understood in the context of greater individual liberty, where Communism is associated with high level economic planning being done by the central government. In North America, the so-called "Red Scare" era of the 1950s in the United States (peak Cold War) laid out a cultural framework in which US politicians drew an increasingly frightening picture of communism as the absolute withdrawal of personal liberties, and an overt attack on everything good that American life stood for. The McArthy era in the US built on the existing mistrust of government in general that is pervasive in American culture, and used broad accusations to attack anyone who had even remotely "left-leaning" political ideas. We see modern day conservatives in both countries attempting to leverage the resulting fabric by equating any kind of government intervention in society (including social safety net programs) with the extremes of the totalitarian dictators who led certain communist governments. However, most people who advocate for things like single payer (socialized) health care, are not arguing for the government to take over control of the economy. Their ideals are often inspired by the successful governments in Europe which are largely Social Democracies. The argument that somehow this represents an unwarranted intrusion by the state into the lives of individuals is at best hyperbole, at worst it represents a classic example of the Slippery Slope fallacy by drawing Socialism as being far closer to Communism than it actually is. The failed economy argument is a more complex one to address. Usually the argument goes something along the lines of "government cannot / should not borrow money because communist regimes suffered economic collapse". Superficially, this almost seems reasonable. 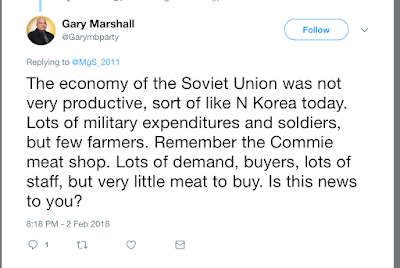 The collapse of the Soviet Union is fairly well documented, and the relative lack of consumer goods in Soviet Russia is pointed to as a primary example of how central planning failed. A failed economy is a disaster for the people who live in the country. This is unquestionably true. One only has to look at the regional failures in North America to understand a "closer to home" example - the Rust Belt. The decline of industrial production in North America gutted regional economies which had previously relied on local heavy industry to sustain them. While this hasn't resulted in the outright collapse of the US economy, it has caused a major exodus of population, and at least one municipality has had to declare bankruptcy and abandon providing infrastructure services to major areas. Generally, a robust economy will survive one or two segments experiencing a downturn. So, why did the Soviet Union's economy collapse so thoroughly? The simplistic answer is to claim that central planning is an inherently flawed way to run an economy, and the bureaucrats simply couldn't see what was happening through their own fantasies. However, such a claim is both overly simplistic, and it ignores a lot of context. First, we cannot ignore that the Soviet Union had been largely isolated in many ways. Much of its trade was within the confines of its allied countries and vassal states under its direct control. China was, at the time, not the industrial power it has become in the last few decades, and the Soviet Union found itself trapped in a cycle of competing demands which it could only meet some of. In many respects, the Cold War became a proxy war for control over client states. The US was able to force the Soviet Union to expend significant resources in that conflict while limiting the ability of the Soviet Union to acquire cash reserves needed to support their efforts in a world that was using the US dollar as a reserve currency. In short, the Soviet Union's economy collapsed from a series of internal and external pressures which the US economy has never faced to date. External pressures like sanctions, or volatile resource prices play a significant role in the collapse of an economy. Venezuela is one such example, where its dependence on oil prices at a time when other players in the oil market decided to increase production caused a major drop in government revenues. Coupled with US economic sanctions and political upheaval in the wake of Chavez's death, the government has floundered with the economy. Remove the sanctions and political uncertainty, and one might well see a substantially different outcome. Again, one might well look to how various states that are nominally allied with the US are doing in various regions of the world and ask whether those states have prospered under governments that the US has backed. The answer here is more mixed. Some, like South Korea, certainly have. Yet others, such as some Central American nations, have suffered under the yoke of brutal dictatorships. Yeah - there's that dictator word again - it's important, isn't it? It is also quite important to recognize that there are significant differences between a "consumer economy" such as the United States has fostered, and other models. The consumer economy looks at everything through the lens of consumption. Basically, the function of the economy is solely measured on the basis of product sales. Nobody pays attention to other factors like whether the product is necessary, or if the price is fair (the magical "invisible hand" of the free market corrects this ... right? ), or whether a given product or service needs to be universally accessible (e.g. healthcare). So ... what does all this mean? The Soviet Union opted for a centrally controlled model which did not emphasize the consumer. However, it's important to recognize that it did work reasonably well for the Soviet Union until the 1970s. Further, in the wake of the Soviet Union's collapse, it has become much clearer that the Soviet Union cannot be seen as a simple economy. The ability of that country to create its own variations on many Western consumer goods (e.g. Russian versions of numerous western home computers from the 1980s) suggests that the centralized planning only went so far. We who live in the western countries need to be cautiously skeptical about the picture that was painted for us in the latter years of the Soviet Union. Although China is a communist country, it is a much different conceptualization of communism, and one that has adopted a much different model of market economics in the last thirty years. It is "neither fish nor fowl". It has a strong, often overbearing it seems, central government but this is contrasted with an economy that has adopted much of the principles of the western market economy (and often without the controlling regulations we have added). It is perhaps the unique pragmatism of the Chinese approach that makes me skeptical about blithely condemning approaches to politics and economics in other countries. Often, we only have a partial picture painted for us by those who sit in positions of power. However, there is a big difference between the command-and-control economy of the Soviet Union and the more market driven economies of democratic socialist countries like Norway or Sweden. These are countries with comprehensive social programs for all of their people, and yet you cannot by any means argue that they are centrally planned. They tend to have a greater emphasis on government delivery of key services like health care, and regulation of industry compared to the market fundamentalism that we have seen in the United States. Does that make them bad countries? Not at all - in fact they are stable nations which have relatively content populations. To conflate government intervention in domains intended to protect the people of a nation with the centralized "command-and-control" model of the Soviet Union is at best a stretch, at worst a false analogy. For the most part, the "but, but ... Communism!" cry often heard from the libertarian influenced right is nonsense. It is, at its heart, an attempt to resurrect the zombie of McArthyism. McArthy was a terrible human being who used the politics of fear to forward his personal agenda for greater power. We should fear those who would resurrect his politics far more.